A unique Welsh milk brand, which uses pioneering scientific techniques to naturally boost the amount of Omega-3 in dairy products, is set to hit the shelves. At next month’s Royal Welsh Show Pembrokeshire dairy farmer Will Prichard will be launching OM3, a whole milk that has been naturally enriched with Omega-3. 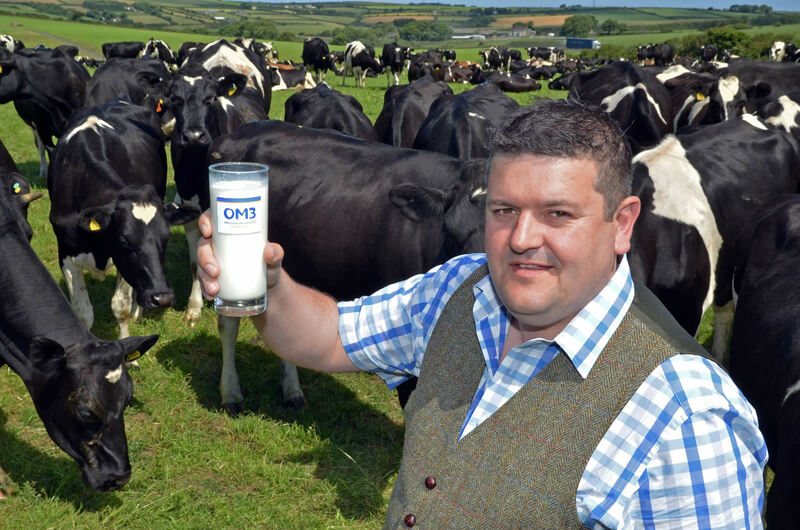 With help from Cywain – a project part funded by the Welsh Government created to bring added value to primary produce within the agricultural sector – Will has been able to take his project forward and create the OM3 brand. He believes the technology that has created OM3 will enable people to easily boost their Omega-3 levels and pursue a healthier lifestyle. OM3 is being processed and bottled locally in Haverfordwest by Mark Hunter Ltd, thus keeping the supply chain close to home too. Will Prichard with his dairy herd.